On a blustery winter evening, after a hectic day,who wouldn’t love to relax with their family,in their warm home, on a cozy couch, and dunk warm crusty bread lathered with butter in a bowl full of steaming creamy soup.I guess you all would!!! 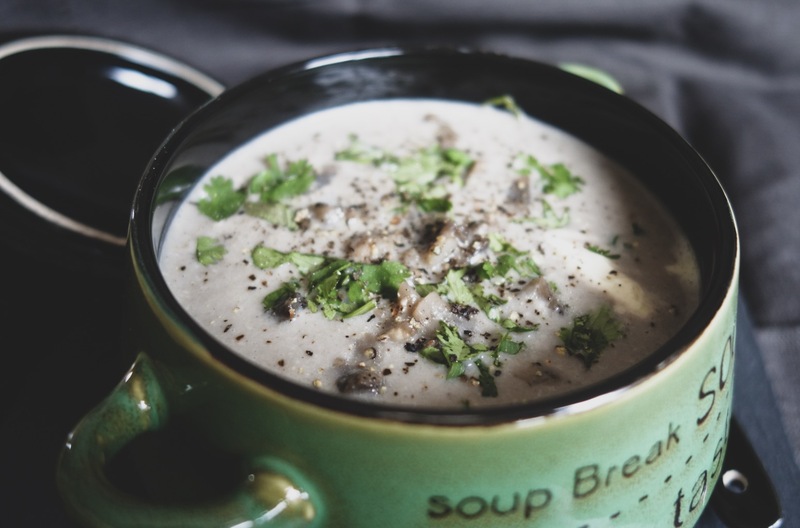 If you love your mushrooms, and want to create a warm ,simple but filling soup/starter , I would really recommend you try this recipe.You can pair this with garlic breads, crusty mini cheese bruschetta, toasted and buttered ciabatta , or even a simple cheese toast. 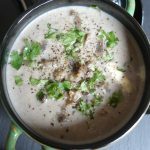 A heart warming delicious creamy soup for all the mushroom lovers. Wash and clean the mushrooms. Slice evenly 10-15 pcs separately . Heat a tsp of butter and saute these for 5-7minutes. Keep aside for garnishing. Heat 2 tbsp of butter ,add roughly chopped rest of the mushrooms, onions, garlic cloves, peppercorns.Pop the lid on. Cook gently till the mushrooms are soft. Add the wholewheat flour and saute till the raw smell of the flour is gone.Please keep stirring to ensure that the flour doesn't get burnt. Add the milk slowly. Continue stirring.Cook for 5-7 minutes, till the milk starts to boil and gets a creamy consistency. Let the mixture cool.Then blend it to form a creamy texture. Bring the mixture to a boil. If required add little more water / vegetable stock to get the consistency you want. Add salt, nutmeg powder . Mix well . Garnish with the sautéed mushroom slices, creme/ Crème fraîche,coriander and crushed pepper. To adjust the consistency of the soup you can add more milk instead of water/ vegetable stock .